This is one of the top ram lambs born here this year. A very substantial, heavyweight ram. His sire seems to be turning out to be a real nick- a leapfrog in genetics compared to his parents, his lamb crop has been phenomenal for growth. Sire’s maternal line is from the now-retired Mist River genetics. Dam is one of my top-performing ewes from Birch Cove farm in Missouri; she is a nice blend of NSIP genetics from the Midwest and South, and she comes with good parasite resistance scores. 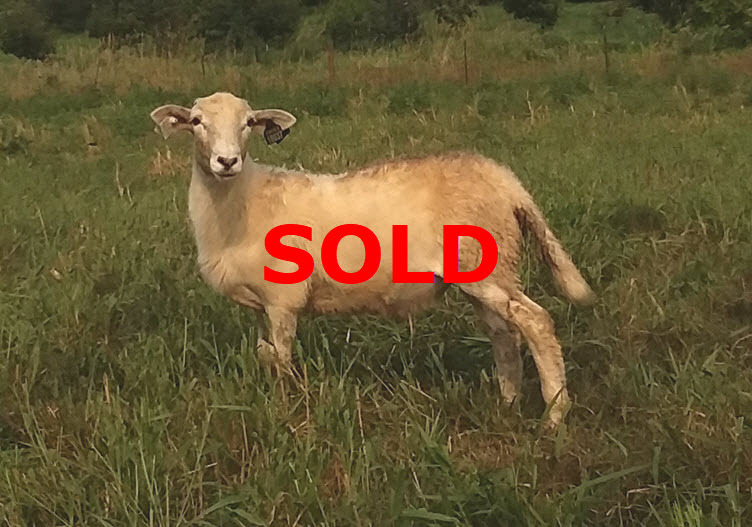 This ram will make a very productive herd sire that can throw a great combo of fast-growing butcher lambs and really valuable replacement ewes with good milk and prolificacy. It’s hard to “have it all” in one animal, this is one of the few! Photo taken August 2018 EBVs from 2018 lamb crop WWT data. This lamb will be weaned 8/19 and ready to go to a new home and breed this fall.